Military Experience Centre01553 760230work MuseumThe Military Experience Centre is an opportunity to experience educational, hands-on, interactive displays and discover British military history. You can dress up and be photographed with current and past military issue kit. We also have an airsoft shooting range where you can shoot a variety of weapons for a small additional cost. 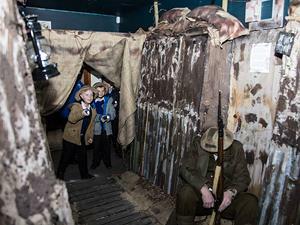 You can discover what life was like during WWI and explore our trench. We bring the D-Day beach landings to life with a D-Day landing craft experience and a German Bunker. We also have lots of other interactive and informative areas covering more recent military history. You can discover women’s contribution and the contribution of the people of Lynn to the war effort from World War One to recent conflicts. The Military Experience Centre is an opportunity to experience educational, hands-on, interactive displays and discover British military history.